The Smart Metering solution proposed by Olivetti is based on the use of a capillary network composed of concentrators able to detect signals of 169 Mhz and 868 Mhz or other frequencies used by the most widely-installed meters and sensors. 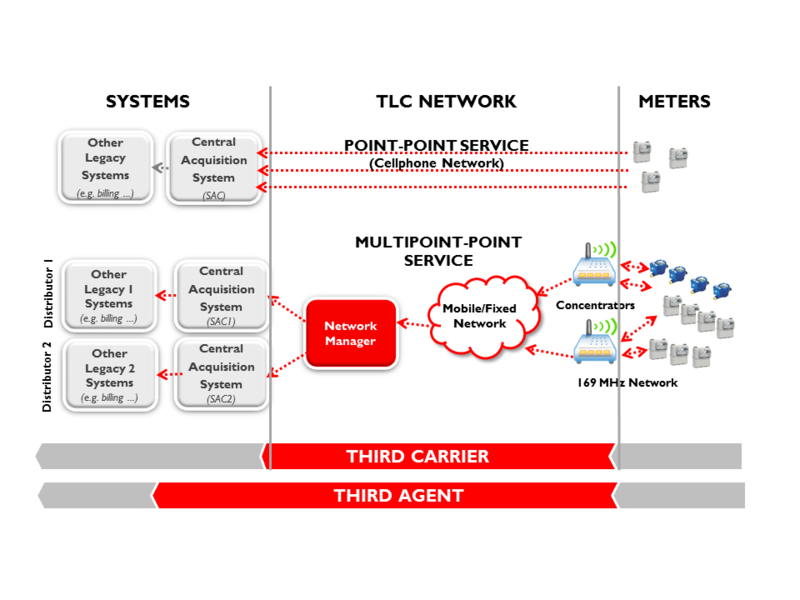 For developing the Capillary Network, Olivetti is able to exploit the skills and development tools Telecom Italia has been using for years for developing its fixed and mobile TLC networks. These instruments permit the proximity network to be designed with great levels of accuracy. Network assets already available to Telecom Italia (base radio stations, distributors, electrical cabinets, ...) allow a high level of cover to be achieved, so enabling optimisation of deployment and management costs. The solution proposed by Olivetti, based principally on a 169 Mhz Capillary Network, is defined as a «Point-Multipoint» solution. In this case the concentrators installed over the geographical area collect the information coming from the various meters, acting as bridges between the many collection points and the central data processing system (SAC). The dsi solution of TI Digital Solutions uses point-point connections (2G/3G/4G connectivity via meter-mounted SIM cards) only in cases where use of concentrators would not be economically sustainable such as, for example, in scarsely populated areas. Third Carrier Model: Olivetti operates as TLC network manager consigning the measurement data to the Customer’s SAC without evaluating its contents. Third Agent Model: In this case, in addition to TLC network management, Olivetti manages also the SAC providing the Customer with the measurement data in a suitable format for their legacy systems (invoicing, CRM, ...) with a guarantee of the coherency and consistency of measurement data.